I’m not much of a fish eater, especially salt-water fish. I grew up eating lots of perch and catfish that my dad caught and we rarely bought fish in the store, other than Gordon’s Fish Sticks. So, when my husband said he wished we ate more fish, I looked to see what was available…and cheap…from Whole Foods. Mackerel was inexpensive and I knew I liked the taste of it when I had it at a Japanese restaurant, so I bought one to split with my husband. I did a quick search of the internet and found various ways to prepare a fresh mackerel. The following recipe is one that I modified slightly from a Jamie Oliver recipe. Heat a large frying pan or griddle until very hot. Add mackerel filets, skin side down, and sprinkle with salt, pepper, and lemon zest. Reduce heat to medium and cook 8 minutes. Mix sauce ingredients while fish is cooking. Turn fish and cook an additional 4 minutes. 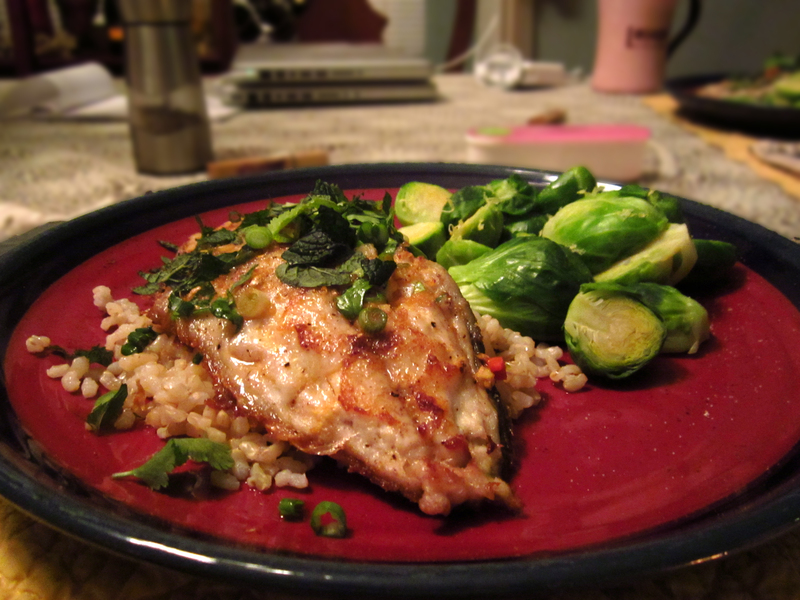 Divide brown rice between two plates and top with mackerel filets. Spoon on a generous amount of the sauce over the top of the fish, then add the remaining chopped cilantro, mint, pepper and green onion.